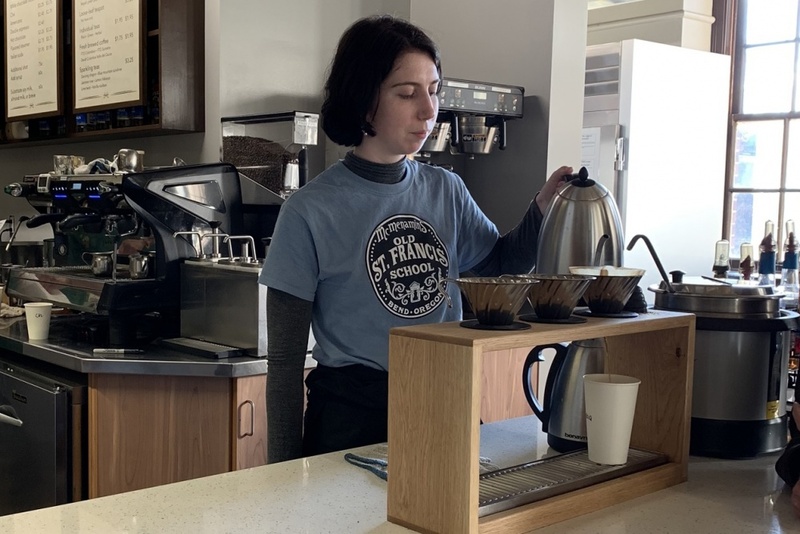 For those looking to get caffeinated or grab a healthy-to-indulgent bite to eat, the freshest coffee house on the UO campus can still be found in an historic, familiar place. 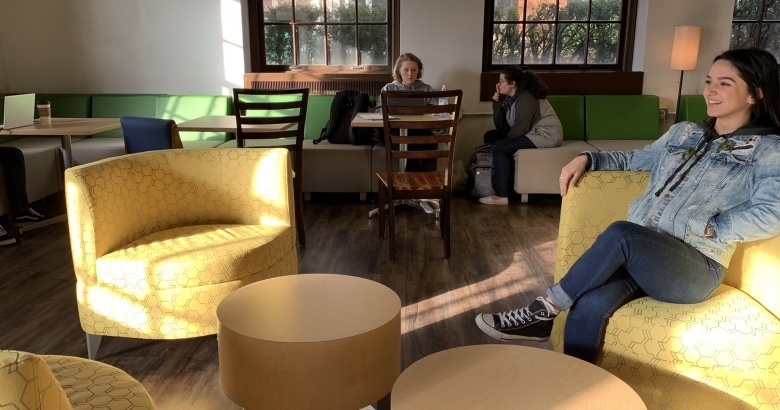 Located on the ground floor of Knight Library in the same room that until recently housed The Daily Grind, the coffee shop has been refurbished and rebranded Café Verso to reflect the significant evolution of both its menu and its ambiance. The changes were implemented with two goals in mind: improving the attractiveness and usability of the physical space and expanding the menu to provide patrons with a greater range of food and beverage choices. Mon-Thr 8 a.m. - 10 p.m.
Sun 12 noon - 10 p.m.
“We got a lot of input from UO Libraries on how students, faculty and staff use the space,” said Tom Driscoll, associate director of housing and director of food services, the unit responsible for administering Knight Library’s café along with four additional coffee spots around campus. Most of the construction work took place over winter break, and the café reopened Jan. 22. Although the extent of the remodel was somewhat constrained by the nearly century-old engineering of the Knight Library building and its preservation on the National Registry of Historic Places, housing has created a more open and welcoming sense of space with a new, reoriented service counter, new furniture and a more open and flexible seating plan. "Our approach to the project was to take advantage of the many windows the space offered to create a clean, well-lighted café that could accommodate a quick stop for coffee as well as an afternoon lingering over a pot of tea and a good book," Driscoll said. “The new thing I am probably most excited about is the pour-over coffee,” said Joshua Harris, food service manager with University Housing. In addition to the carryover offerings of drip-brewed and espresso drinks, Café Verso customers can opt for a cup prepared in this artisanal method. Selected from a globe-spanning menu of organic, fair-trade coffees, the beans are ground fresh to order and then extracted with water poured by hand from a gooseneck kettle. Customers have to wait a little longer after placing an order, Harris explained, but the result is coffee with a unique flavor profile that many people find more nuanced and pleasing than drip brew. For tea lovers, Café Verso offers a selection of direct trade, loose-leaf teas that can be brewed in takeout sachets or, for those who want to settle in for a long café study session, take-to-your-table glass steeping pots. New food options include bakery-fresh cakes and cookies; full-service bagel prep with whipped cream cheese and other premium toppings; an expanded selection of healthy grab-and-go snacks; and a soup of the day that is prepared on campus using fresh ingredients. The shelves and cold cases at Café Verso will continue to offer many of the food and beverage choices that have long been popular with Daily Grind customers, including breakfast pastries, juice, yogurt, fresh fruit, burritos, salads and deli sandwiches. More than 400 suggestions were gathered by UO Libraries in a 2017 campus survey that explored renaming the space. Café Verso, the winning entry, was submitted by Caroline Phillips, then a graduate student in the College of Design. Adriene Lim, dean of libraries and Philip H. Knight Chair, noted that verso has even more meanings in the language of libraries — it also refers to the left-hand page of a manuscript, or the reverse side of a book’s title page, where the publication information appears.